Have you ever looked at a traditional gym exercise bike and wondered if there’s a better way to bike? Recumbent exercise bikes are the answer. These ergonomically-designed exercise bikes are extremely popular because they are a good cardio home exercise option that are gentle on the body, while still improving cardiovascular health. They are especially great for seniors, those just venturing into cardio, and those who have a lot of weight to lose. In this article, we’ll review the 6 best recumbent bikes on the market. Then, our buyer’s guide will help you learn the details and lingo for buying a recumbent exercise bike. The last section has FAQs to help you get the right facts. Schwinn made a name for themselves in the outdoor cycle market before moving in on the fitness market. 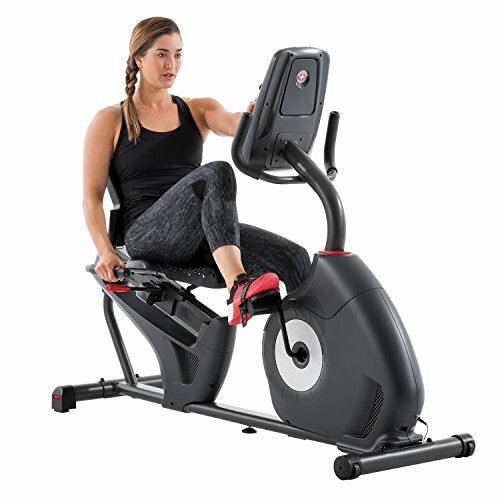 After just a few years, they have established themselves as a market leader thanks to the quality of such products as the Schwinn 270 Recumbent. This bike features a high speed, high inertia perimeter weighted flywheel to provide a very smooth, natural level of mobility. The dual three-piece pedal crank is a huge step up from most recumbents, which feature a single piece crank. It allows for much smoother braking and resistance change and just feels a lot more natural than a single piece pedal crank. The monitor on the 270 is a standout, featuring 29 workout programs to suit every member of the family. It also gives you 25 levels of eddy current resistance, ensuring that you can always progressively increase your training intensity. That makes this a great bike for beginners, as the monitor basically takes you by the hand and leads you through every training program, even automatically adjusting the resistance level as you train. Another great feature of the monitor of the 270 is that it allows you to download your workout details to your computer or phone. That allows you track your progress from workout to workout. The seat and back support on the 270 provide an impressive level of comfort and support. The large vented seat back includes lumbar support while the cushioned seat bottom has a contoured leg area. On top of everything else, this bike looks great, so you’ll be proud to display it, either in your gym or your lounge. The best feature of the Schwinn 270 is undoubtedly the price. You can own this bike for less than a half of what you might pay for other recumbents with similar features. If that price isn’t low enough, Schwinn makes a 230 that is even cheaper! We’ve compared the Schwinn 270 vs 230 here, and we’ll also talk more about it below. This bike is particularly good for seniors. It’s got the most comfortable design because of the back support and seat cushioning. It tops our list of Best Exercise Bike for Seniors. All that makes the Schwinn 270 a no-brainer and a very deserving winner of our 2019 best recumbent bike overall! The Nautilus R616 is an impressive looking mid-upper price range recumbent that provides you with an impressive 29 built-in workouts and 25 levels of resistance (the same as our top rater, the Schwinn 270). It is very solidly made, with a 12-14-gauge steel frame that will keep you solid no matter how hard out you are pedaling. The R616 is rather quiet, but it can be prone to creaking from the seat. Complete seat adjustment makes this bike suitable for people from 4’11” to 6’3”. The magnetic resistance works by way of a pair of magnets that get closer or further away from the flywheel depending on the setting. Because they never touch the flywheel, the movement is extremely fluid. The 3-piece crank provides you with a smooth, natural pedaling motion. This bike is slightly more expensive than the Schwinn 270 and slightly noisier. The fan is also not as powerful. For those reasons, it slips out of the number one slot, but entrenches itself as our second favorite recumbent exercise bike overall. You can check out our full review of the Nautilus R616 to get more info. The Exerpeutic 400XL is a great entry level recumbent that uses a simple, but quite functional, v-belt double-drive transmission system, paired with a precision balanced flywheel. The pedaling motion is not fantastic but it is perfectly acceptable for a budget bike. This bike features a semi-recumbent design so that your legs are at about a 45-degree angle to your hips. This puts more emphasis on your lower thighs and calves. It supports up to 300 pounds in user weight, giving you an idea of how solid this bike really is. The large LCD display is simple but functional, providing you with all the feedback that you need. This includes your speed, time, distance, calories burned and heart rate. This is a foldable recumbent bike, so you can collapse it much like an ironing board for easy storage when not in use. The one drawback is that this bike is not designed for people who are over six feet tall. They will find the pedaling motion too restrictive due to the shorter length of the wheelbase. Apart from that this is the best budget recumbent that is solid, smooth and powerful. The Schwinn 230 is the little brother of our top performer, the Schwinn 270. We’ve done a complete Schwinn 230 review in the past, but here are the specs. It has fewer programs built-in (22 compared with 29) and resistance levels (20 compared with 25) but the actual engine of the machines are very similar. The flywheel is slightly lighter but still provides you with an excellent level of pedaling performance and fluidity. Unlike the 270, there is no chest strap heart rate provision on this bike, so you will have to rely on the hand-held pulse sensors. It does offer USB data transfer to the Schwinn Connect App, allowing you to keep all of your training information. The Schwinn brand is one of the few that provides you with instant peace of mind based on an outstanding reputation. Its design and build are second to none, which makes this a natural choice for a mid-range recumbent bike. The Sunny SF-RB4601 recumbent makes use of a smooth, consistent belt drive mechanism to produce a natural pedal motion. With a max weight of 300 pounds, it features solid frame construction and user-friendly ergonomic design. This bike also includes some cool extra features, such as the ability to adjust your seat positioning without getting up and self-leveling pedals. An adjustable 8-level magnetic tension control system provides you with plenty of resistance options. A digital monitor provides you with an LCD display of your odometer, heart rate, distance, speed and calories, so you can keep tabs on your important training data. The Stamina Elite Total Body is one of the few recumbent bikes to feature a dual pedal design. This means that you have pedals for both your feet and your hands, allowing you to get an effective, low impact upper body workout in at the same time as you are working your lower body. The monitor features 8 selectable resistance levels to provide a smooth progression in your training intensity. Unlike some bikes, you do not lose any resistance power as the bike transitions between resistance levels. However, there are no built-in workout programs on this bike. The adjustable angle seat back allows you to customize your positioning. This is another rarity among low impact recumbent bikes. The seat itself is very comfortable, which many online reviewers have pointed out. The recumbent bike market is huge, with more than 250 models to choose from. 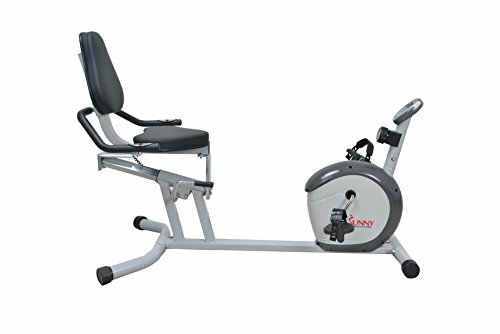 In this section, we’ll help you refine your search by pinpointing precisely what you need to be looking for in choosing the ideal recumbent exercise bike to meet your needs. The pedals are the point where you will be exerting the most force when cycling. That means that they need to be sturdy, snug-fitting, and comfortable. Obviously, they need to accommodate your foot size. However, most pedals sizes are pretty standard. The customization of fit comes by way of the straps that fit over the pedals. Make sure that the straps are adjustable, firm, and easy to work with. 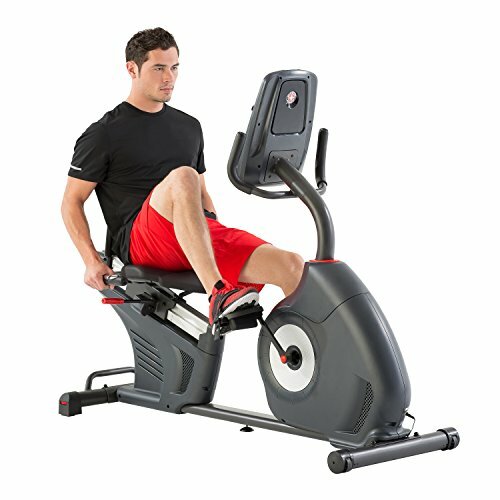 Due to their unique design, the majority of recumbent bikes use a weighted flywheel to provide the resistance. The heavier the flywheel, the more natural and fluid the pedaling motion will be. You should also look for a bike that provides multiple levels of resistance by way of a dial or monitor input. This allows you to progressively increase the intensity of your workout over time. If you are a beginner, you will want at least eight levels of resistance, while more advanced cyclists will want to double that minimum requirement. Realizing that you will be spending quite a bit of time sitting on this thing, you will need a seat that is large enough and well-padded enough not to cause undue gluteus maximus discomfort. A seat that is ergonomically contoured will give the most comfort. Seats on recumbent bikes are always going to be more comfortable than an upright or a spin bike (which is clearly part of their appeal). Some of the pricier recumbents will have gel inserted seats to provide you with the best level of comfort. You should also look for a bike with a generous level of back support. You should be able to lean back into the seat just as if you were reclining in a chair. Ideally, the backrest should be adjustable both forwards/backwards and angle-wise. It should have some padding, along with ventilation and aeration considerations built into its design. The monitor on your recumbent needs, first and foremost, to provide a large enough display that you can clearly read it from your seated position. 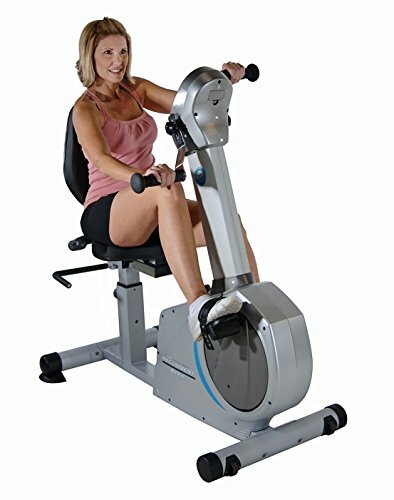 On a recumbent, you are further away from the monitor than on an upright bike, so you don’t want to be squinting and straining just to see your training parameters. It should provide you with your training time, calories burned, speed, and distance traveled, just to name the most basic parameters. Depending on how much you want to pay, your bike may feature built-in exercise programs. These are helpful, but most people never use more than three or four, so don’t let the fact that a particular bike has 28 built-in programs while another has only 18, sway you. Most of the high-end brands allow you to sync your monitor to their app so that you can save your training diagnostics for later analysis. This is a nice addition, but again, shouldn’t be a game changer. Most recumbent bikes will have a seat that is height adjustable. But when it comes to a recumbent, there is more to the size game than that. The height of the front wheel will determine how far the pedals are from the seat. A larger wheel will place the pedals farther away. This can be a problem for shorter people. So, if you are under 5’4”, you should look for a bike with a relatively small front wheel. The distance between the seat and the wheel is called the wheelbase. People who are quite large in the midsection area will want to make sure that this area is adjustable and allows for enough room so that your pedaling motion is not cramped. At the other extreme, a short wheelbase will allow for faster, more athletic pedaling. Recumbent bikes usually provide hand grips around the base of the seat so that your arms are hanging down by your sides when you are cycling. However, if you are wanting a more natural cycling motion, some bikes also provide handles up at shoulder level and in front of you. What is the difference between an upright and a recumbent bike? Recumbent bikes sit you much lower to the ground, with the pedals out in front of you rather than directly below you. This positioning is actually more biomechanically sound than the traditional cycling position, placing less stress on your joints (particularly the knees). Recumbent bikes feature a larger seat than an upright or a spin bike. They also add a back support for added comfort and spinal protection. Not sure if you want an upright or recumbent bike? Our list of Best Exercise Bikes Under $1000 features both so you can find your best fit. 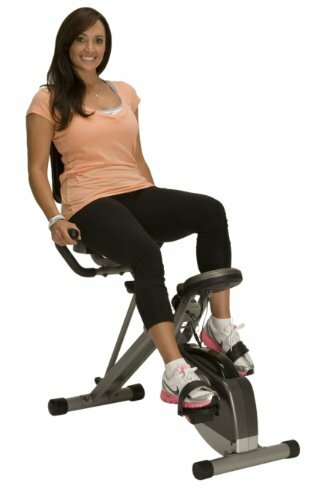 How does the unique positioning on a recumbent work your body differently? The semi-circling position that your feet go through when pedaling on a recumbent is more natural and less jarring than the upright elliptical pattern of upright bikes. In the recumbent position, the knee and hip are not having to flex as much as when you use an upright bike. The lower height at which you are exercising is also safer. It allows you to remain in a naturally seated position, avoiding the tendency to lean in towards the handlebars, or even to stand on the pedals, both of which place an inordinate amount of pressure on the erector spinae muscles of the lower back. 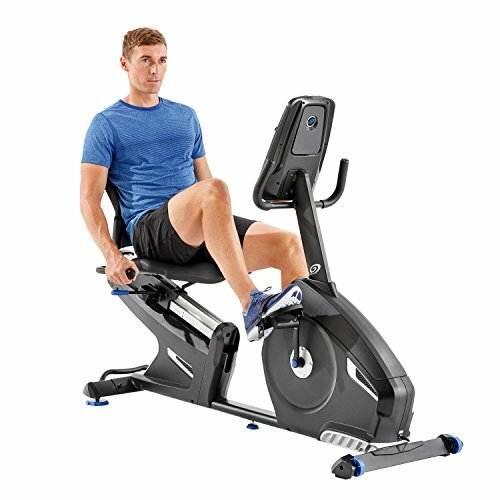 While all types of cycling will help to build the muscles of your legs, the unique angling of recumbent cycling allows you to target certain areas more specifically. These include the glutes, hamstrings and inner quads, as well as the calves. When you get off the recumbent for the first few times you will feel these muscles more than if you had just spent your time on an upright bike. That’s a good thing when you consider that the glutes, hamstrings and inner thighs are chronically undertrained in most people.